Time was when a yacht owner would rock up to Monaco or Ibiza and hop off to dance the night away on one of the world’s most jet-set club crawls. Nowadays, the in thing is to make the party come to you. Most yachts are designed to host 12 passengers plus crew, sometimes with outdoor dining space for half as many people again so as to include shore-based friends. But when you want to party hard, the luxury yacht needs to accommodate 50, 100 or even more people and the design has to take everything into account, from heads to handrails. Whether you're spending a week or two on one of the best charter party yachts or looking to build your own, the following key elements are essential if you want your yacht to be the hottest invitation in the harbour. Circulation The single interior and aft deck staircase that usually serves to move 12 people through three decks will be the source of unseemly traffic jams on party night. 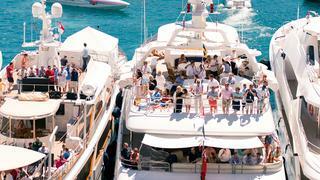 The 95 metre Kismet, for example, is designed to host 200 people for corporate events or celebrations. Thus her party central main and upper decks are served by two interior staircases and a lift, while the aft exterior decks are connected by multiple separate staircases. Crew enjoy separate portside staircases, including one that allows them to pop out undetected in the top deck pantry. A word about walkaround side decks here. Not only do they improve yacht operations for things such as cleaning and docking, they allow guests to stroll away from noisy music areas for a good conversation, a phone call or to find respite on all that nice real estate on the forward deck areas. Open side decks enhance serviceability for crew and caterers as well. Speaking of caterers, what large home these days is built without a caterer’s kitchen or pantry for staging large events? Your typical onboard galley may be up to the task of dispensing 62 meals a day, but they aren’t all served at the same time and where will you put 400 canapés and stacks of petits fours? The crew lounge? And how accessible is that? Large pantries on each deck aren’t a luxury: for owners who entertain, they are a must. And those open portside decks can be used as staging areas. Time was when a yacht owner would rock up to Monaco or Ibiza and hop off to dance the night away on one of the world’s most jet-set club crawls. Nowadays, the in thing is to make the party come to you. Most yachts are designed to host 12 passengers plus crew, sometimes with outdoor dining space for half as many people again so as to include shore-based friends. But when you want to party hard, the luxury yacht needs to accommodate 50, 100 or even more people and the design has to take everything into account, from heads to handrails. Whether you're spending a week or two on one of the best charter party yachts or looking to build your own, the following key elements are essential if you want your yacht to be the hottest invitation in the harbour. The single interior and aft deck staircase that usually serves to move 12 people through three decks will be the source of unseemly traffic jams on party night. 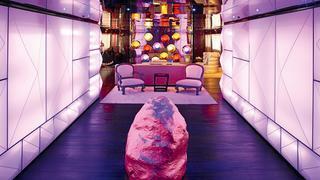 The 95 metre Kismet, for example, is designed to host 200 people for corporate events or celebrations. Thus her party central main and upper decks are served by two interior staircases and a lift, while the aft exterior decks are connected by multiple separate staircases. 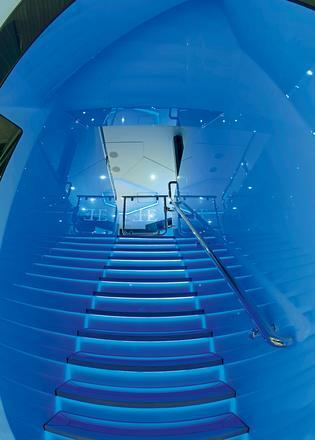 Crew enjoy separate portside staircases, including one that allows them to pop out undetected in the top deck pantry. A word about walkaround side decks here. Not only do they improve yacht operations for things such as cleaning and docking, they allow guests to stroll away from noisy music areas for a good conversation, a phone call or to find respite on all that nice real estate on the forward deck areas. Open side decks enhance serviceability for crew and caterers as well. Speaking of caterers, what large home these days is built without a caterer’s kitchen or pantry for staging large events? Your typical onboard galley may be up to the task of dispensing 62 meals a day, but they aren’t all served at the same time and where will you put 400 canapés and stacks of petits fours? The crew lounge? And how accessible is that? Large pantries on each deck aren’t a luxury: for owners who entertain, they are a must. And those open portside decks can be used as staging areas. 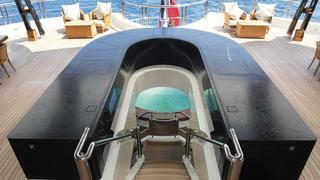 Bars are not random things: cleverly placed, bars are a smart way to move guests around the yacht. People congregate at them, especially if they have comfy stools, so don’t put them near the stairs. Use them to draw guests across a deck. In fact, if you want an atmosphere in which guests mingle or do business, eliminate wet-bars in favour of passed-drinks service on all but the uppermost deck. The series of yachts named Gallant Lady, operated by Jim and Jan Moran for corporate and philanthropic purposes, used this scheme to eliminate knots of people who stayed in one space. Bars need to be placed with respect to crew service pathways as well: no one wants to see crew waltzing across the dance floor with a dripping black rubbish bag. 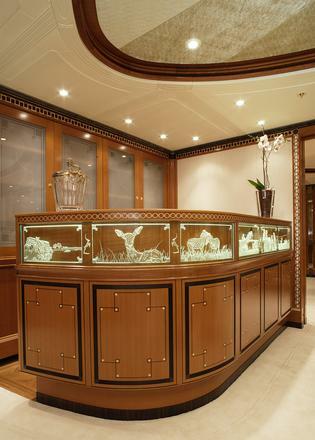 Bars are not random things: cleverly placed, bars are a smart way to move guests around the yacht. People congregate at them, especially if they have comfy stools, so don’t put them near the stairs. Use them to draw guests across a deck. In fact, if you want an atmosphere in which guests mingle or do business, eliminate wet-bars in favour of passed-drinks service on all but the uppermost deck. The series of yachts named Gallant Lady, operated by Jim and Jan Moran for corporate and philanthropic purposes, used this scheme to eliminate knots of people who stayed in one space. Bars need to be placed with respect to crew service pathways as well: no one wants to see crew waltzing across the dance floor with a dripping black rubbish bag. Parties involve grazing and that means you will need multiple food stations and places for show-stoppers such as ice sculptures (which involves lighting) and perhaps signature spaces such as a teppanyaki grill. The 96 metre Palladium, designed by Michael Leach, has huge alfresco buffet servers where the stone counter surface can be chilled or warmed as dishes require. The 42 metre expedition yacht The Big Blue has a custom-made table with a long trough down the middle for keeping chilled shellfish at the ready. For fine-tuning deck design, ask a party planner how he or she would stage a party in that space. You’ll get dozens of questions, from floral arrangements and seating to where you can plug in a microphone when the owner wants to make a speech. Hint: a good backdrop for photos. Parties involve grazing and that means you will need multiple food stations and places for show-stoppers such as ice sculptures (which involves lighting) and perhaps signature spaces such as a teppanyaki grill. The 96 metre Palladium, designed by Michael Leach, has huge alfresco buffet servers where the stone counter surface can be chilled or warmed as dishes require. The 42 metre expedition yacht The Big Blue has a custom-made table with a long trough down the middle for keeping chilled shellfish at the ready. For fine-tuning deck design, ask a party planner how he or she would stage a party in that space. You’ll get dozens of questions, from floral arrangements and seating to where you can plug in a microphone when the owner wants to make a speech. Hint: a good backdrop for photos. Make a bar truly multi-functional by using it to house a smoke machine, coloured lights and speakers. “Wireless smoke machines can be positioned in multiple points. In a disco environment they boost the effects of lighting and lasers,” says Sara Stimilli, from the Italian AV firm Videoworks. “I like haze machines that produce light and fog to enhance the presence of a performer,” adds Stimilli. Light machines that have programmed show modes as well as sound-activated modes are most popular with DJs. One piece of kit called the ADJ Fog Fury Jett blasts fog out to a distance of five metres, mixed with a beam of colour. How about a snow machine that weighs only 3.5 kilos, is small enough to fit in an overhead cupboard and throws the white stuff over a distance of six metres? The really cool thing is that the owner can control the lights and the atmospheric effects from their smart watch. Make a bar truly multi-functional by using it to house a smoke machine, coloured lights and speakers. “Wireless smoke machines can be positioned in multiple points. In a disco environment they boost the effects of lighting and lasers,” says Sara Stimilli, from the Italian AV firm Videoworks. “I like haze machines that produce light and fog to enhance the presence of a performer,” adds Stimilli. Light machines that have programmed show modes as well as sound-activated modes are most popular with DJs. One piece of kit called the ADJ Fog Fury Jett blasts fog out to a distance of five metres, mixed with a beam of colour. How about a snow machine that weighs only 3.5 kilos, is small enough to fit in an overhead cupboard and throws the white stuff over a distance of six metres? The really cool thing is that the owner can control the lights and the atmospheric effects from their smart watch. Video screens are no longer single installations in a cabinet. Kismet, for example, has two walls that are two decks high, creating ambient experiences for guests with a menu of visual backgrounds. They can also act as virtual windows with live HD camera input or a video loop. 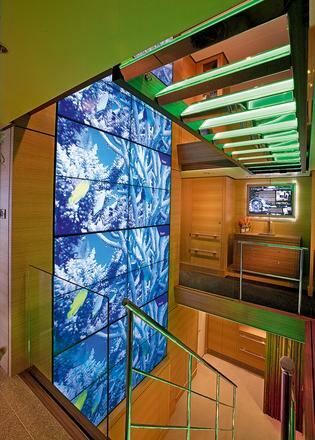 The 45 metre expedition yacht Big Fish started the trend in 2010 with a single video wall at the core circulation area that showed the day’s activities or multiple sports events simultaneously. Nothing says party like coloured lights and incorporating indirect RGB lighting elements into your plan is an easy way to change the mood. The 66 metre Ester III has deck areas where large opaque panels that look like innocuous wind-breaks by day, light up the nights, bathing the decks in all the colours of the rainbow. Nowadays we also see the use of the light beams obtained by narrow-focus LEDs and reflectors. Laser lights are a hot item, as are searchlights that sweep across the sky or pulse over a yacht, like a beacon for beautiful people. A projector loaded with images and a special lens can also be directed to bounce images off a mirror to create holograms. Nothing says party like coloured lights and incorporating indirect RGB lighting elements into your plan is an easy way to change the mood. The 66 metre Ester III has deck areas where large opaque panels that look like innocuous wind-breaks by day, light up the nights, bathing the decks in all the colours of the rainbow. Nowadays we also see the use of the light beams obtained by narrow-focus LEDs and reflectors. Laser lights are a hot item, as are searchlights that sweep across the sky or pulse over a yacht, like a beacon for beautiful people. A projector loaded with images and a special lens can also be directed to bounce images off a mirror to create holograms. Every experience has a soundtrack. Charlie Birkett, co-founder of Y.CO, is so tuned in to the role music plays in the yachting lifestyle that he’s partnered with DJ Natalie Earp of Sound Purpose, to create custom music experiences called Y.Play, so yachts can have personalised playlists. Of course, speaker placement is critical to enjoyment. 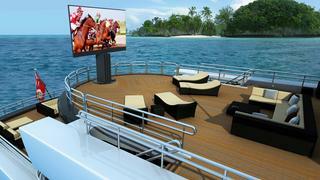 “For most shipyards, the default mode is to position speakers in the overhead,” says Birkett. “The ceiling is the worst place for music and movie sound. Only speakers that issue emergency instructions should be in a ceiling. For surround-sound sensation, you want music to travel laterally.” Custom thin speakers can be mounted practically anywhere and disguised with special fabrics. A device called a ribbon tweeter is part of Y.CO’s disco deck kit because the sound is transmitted from a surface, not a single point. The owner of the 85.1 metre Solandge, whose build was managed at Lürssen by Richard Masters, ensured a professional DJ station was built into the furniture of the sundeck, ensuring an adequate supply of power and wiring to all speakers on board. 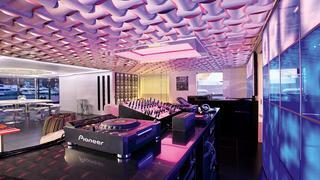 “A lot of yachts try to squeeze the DJ into a pantry,” says Masters. “That doesn’t work for anybody.” On Kismet, the connection for a DJ table is on the observation deck – a great vantage point for managing lights and music – and one can patch in the connections for anything. The key is putting waterproof plugs in all the likely places. Planning for a party boat means being upfront about expectations and bringing the AV company into the mix early enough to avoid disappointment later. At last spring’s Superyacht Design Symposium in Kitzbühel, Austria, Maurizio Minossi from Videoworks spoke about a party deck installation with a power budget of 8,000 watts – about 80 times that of a car stereo. The tricky part is, the bigger the speakers, the closer they need to be to the amplifier. As for Karaoke… John Reimer recommends spending more for a system that lets you change the key of a song to match the singer’s range. A professional mic is worth the £200 or so to deal with all conditions and give guests the best shot at stardom. Every experience has a soundtrack. Charlie Birkett, co-founder of Y.CO, is so tuned in to the role music plays in the yachting lifestyle that he’s partnered with DJ Natalie Earp of Sound Purpose, to create custom music experiences called Y.Play, so yachts can have personalised playlists. On Kismet, the connection for a DJ table is on the observation deck – a great vantage point for managing lights and music – and one can patch in the connections for anything. The key is putting waterproof plugs in all the likely places. Planning for a party boat means being upfront about expectations and bringing the AV company into the mix early enough to avoid disappointment later. At last spring’s Superyacht Design Symposium in Kitzbühel, Austria, Maurizio Minossi from Videoworks spoke about a party deck installation with a power budget of 8,000 watts – about 80 times that of a car stereo. The tricky part is, the bigger the speakers, the closer they need to be to the amplifier. John Reimer recommends spending more for a system that lets you change the key of a song to match the singer’s range. A professional mic is worth the £200 or so to deal with all conditions and give guests the best shot at stardom. Most onboard cinemas can only accommodate the number of people on a legal passenger manifest. So if you want to share your story with the world, you need an outdoor screen. A growing number of yachts are fitted with front- or rear-projection screens that drop from the overhead, but Porsche Design makes a 201-inch LED screen called C Seed, with more than 780,000 LEDs. HD rear-projection portable screens are available to 16 x 27 inches, or 382-inch diagonal. Imagine a next-gen Blu-Ray UHD player driving that! UHD content is four times the resolution of full HD, or 3,840 x 2,160. But it won’t just be the resolution of UHD, these Blu-Rays will support a larger “colour space” or greater percentage of the visual spectrum. The current HDTV colour band is about 30 per cent of the visible spectrum, whereas the next generation BT.2020 colour standard will render 75 per cent of the spectrum for richer, more accurate colours. The next gen Blu-Ray will also be able to take advantage of the faster film rates that directors such as Peter Jackson and James Cameron are now shooting in, eliminating the blurring of action sequences. The good news is that the new UHD Blu-Ray players will be backwards compatible. Most onboard cinemas can only accommodate the number of people on a legal passenger manifest. So if you want to share your story with the world, you need an outdoor screen. A growing number of yachts are fitted with front- or rear-projection screens that drop from the overhead, but Porsche Design makes a 201-inch LED screen called C Seed, with more than 780,000 LEDs. HD rear-projection portable screens are available to 16 x 27 inches, or 382-inch diagonal. Imagine a next-gen Blu-Ray UHD player driving that! UHD content is four times the resolution of full HD, or 3,840 x 2,160. But it won’t just be the resolution of UHD, these Blu-Rays will support a larger “colour space” or greater percentage of the visual spectrum. The current HDTV colour band is about 30 per cent of the visible spectrum, whereas the next generation BT.2020 colour standard will render 75 per cent of the spectrum for richer, more accurate colours. The next gen Blu-Ray will also be able to take advantage of the faster film rates that directors such as Peter Jackson and James Cameron are now shooting in, eliminating the blurring of action sequences. The good news is that the new UHD Blu-Ray players will be backwards compatible.